CADISON P&ID Designer - How to Improve your Process Engineering Efficiency with Smart P&IDs and Built-in Database ? 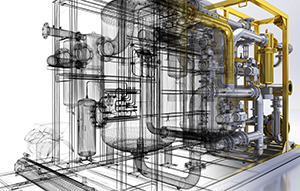 3D Designer is a complete plant design suite for creating plant layouts, pipeline routing, HVAC duct routing, equipment modeling, steel layouts, Isometric drawing creation and report generation. A complete engineering solution with 2D/3D Catalog management tool, Steel Layout, Pipe Support Modeler, Pipe Stress Analysis tools (CAESER II, ROHR2), Inventor Interface, ERP Interface etc.